DETROIT -- The GMC Acadia crossover will get a Denali trim level in the 2011 model year, putting the snazzy designation on a crossover for the first time. 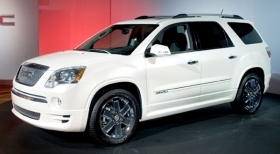 The Acadia Denali will go on sale in the third quarter of next year, General Motors Co. said today. The Denali designation, which denotes a higher-end vehicle, first appeared on the 1999 Yukon. Half of all Yukon sales this year have been Denali models, GM said. Denali trademarks include a honeycomb grille, chrome accents, fascias that are body color, fender flares and mahogany on steering wheels. Acadia launched in 2007 as GMC's first crossover. Its 2009 U.S. sales through November fell 24 percent, on par with the industrywide decline but less than GM's 32 percent slide.